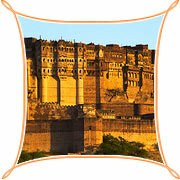 Perched on a 150 m high hill its sprawl is the most formidable and magnificent fort in Rajasthan. Rao Jodha founded it in 1459 but subsequent rulers of Jodhpur have also added to it over the centuries. A meandering road leads to the from the city 5 kms below. Battle scars of canon ball hit by attacking armies of Jaipur can still be seen on the second gate. To the left is chhatri of Kirat Singh Soda, a soldier who fell on the spot while defending the fort against the armies of Amber. There are seven gates, which include Jayapol meaning victory built by Maharaja Man Singh to commemorate his victories over Jaipur and Bikaner armies. Fattehpol also meaning victory gate was built by Maharaja Ajit Singh to mark the defeat of Mughals. And Lohapol meaning iron gate has a moving memorabilia on palm print of the queens of Maharaja Man Singh who threw themselves on his funeral pyre in an act of sati [self-immolation]. The palm imprints still attract devotional attention and are covered by vermilion paste and paper-thin silver foil. This is one of the finest museums in Rajasthan and certainly the best layed out. In the palanquin section of the fort museum, you can see an interesting collection of old royal palanquins including the elaborate domed gilt Mahadol palanquin, which was won in a battle from the Governor of Gujarat in 1730. The museum exhibits the heritage of the Rathores in arms, costumes, paintings and decorated period rooms. PHOOL MAHAL The grandest of Mehrangarh's period rooms, the Phool Mahal was in all likely hood a private and exclusive chamber of pleasure dancing girls once swooned in exhaustion here under a ceiling rich in gold filigree. The Phool Mahal was created by Maharaja Abhaya Singh (1724-1749) and the gold came from Ahmedabad in Gujarat as war booty after his famous victory over the rebellious Mughal governor, Sarbuland Khan. The paintings, royal portraits and the ever-popular raga mala, came much later, in the reign of Jaswant Singh II. JHANKI MAHAL The Jhanki Mahal, from where the royal ladies watched the official proceedings, in the courtyard, today houses a rich collection of the royal cradles. The cradles are decorated with gilt mirrors and figures of fairies, elephant and birds.